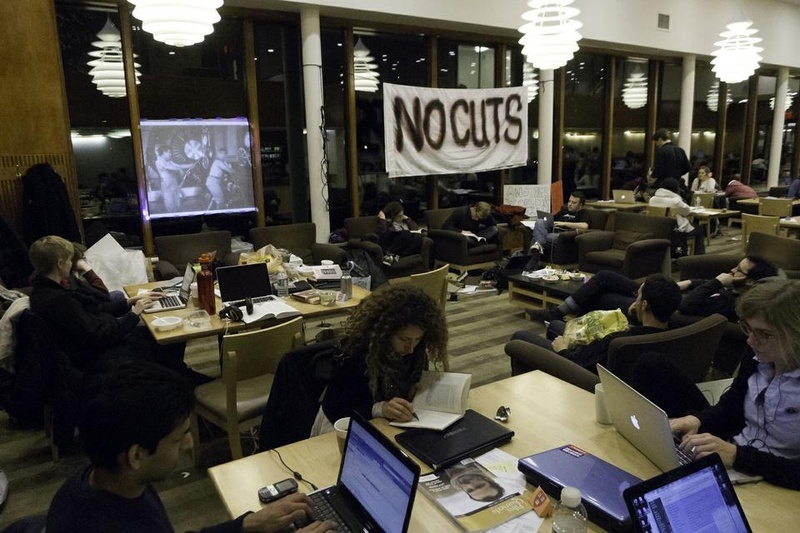 Despite warnings from the University that they could lose their library privileges indefinitely if they continue to sleep in the library overnight, members of the Occupy Harvard movement remained in Lamont Café on Monday to protest announced staff reductions in Harvard libraries. Protestors said Harvard University police officers handed out flyers outlining appropriate conduct for Lamont Library users on Monday afternoon. “Students, staff, faculty members, researchers, visitors, and other users who fail to comply with library rules and regulations are subject to revocation of library privileges, disciplinary action, and legal prosecution,” the flyer stated. 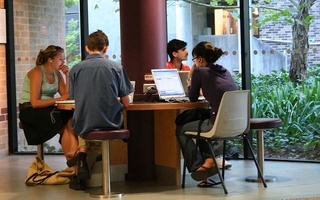 “The protesters in the café will be expected to respect the restrictions placed on access to Lamont Library, including the rights of others to the quiet use of what is a central study space for our undergraduate students,” Faculty of Arts and Sciences spokesperson Jeff Neal said. Protestors said that these guidelines are an inappropriate reaction to their activities. “As undergraduate and graduate students here, losing library privileges is tantamount to expulsion,” a doctoral student in history Andrew J. Pope said. Despite the severity of this threat, Pope said that many protestors would not be deterred from their goal. In response to the University’s announcement earlier in the day about the Voluntary Early Retirement Incentive Program, an optional early retirement offer for eligible library employees, protestors said the package is “coercive,” “ineffective,” and “manipulative” as workers would not know in advance whether they would be laid off or not. Many protestors said that this development would not change their decision to remain in Lamont until Friday at 10 p.m.
Several Occupy supporters met with University President Drew G. Faust Monday afternoon to discuss Harvard’s policy on free speech, which they felt had been violated. At around 11:30 a.m., two Harvard administrators and police officers came to Lamont Café to take down the banner that read “No Layoffs” on one side, “No Cuts” on the other, protestors said. According to Pope, the administrators said they had violated an “unwritten library policy” about hanging up signs in the library. Neal said that the University’s response to the Occupy supporters does not violate Harvard’s free speech policy. A total of four HUPD officers—two at the entrance of Lamont Library and two inside the café—were on guard throughout the night. Bonarene M. S. Wakam ’12, Lamont Café shift manager, said the security guards and the police have been a far more prominent and noticeable presence in the Library than the protestors. “The Occupiers haven’t been disruptive at all. They’ve been quiet and peaceful, and if it weren’t for the oversized posters announcing their cause, you could easily mistake them for a large study group,” added Yi J. Chow ’13, Lamont Café senior manager. Harvard Divinity School professors reacted with surprise—and in some cases, comprehension—to Pope Benedict XVI’s historic announcement Monday that he will resign as head of the Roman Catholic Church at the end of this month. As such, the papal statecraft of the upcoming weeks will not fall on the left-right spectrum familiar to modern American pundits. Rather, those with their eyes on the Catholic Church will witness an old-fashioned display of regional politics, with the majoritarian faction of the Italian old-guard pitted against the new world stewards of growing global Catholicism. If the cardinals are mindful of the issues guaranteed to plague the 286th pontiff of the Roman Catholic Church, they will select a papabile from outside of Europe’s boot. By continuing on this same trajectory, then, Pope Benedict XVI’s succession and the upcoming election offer little in terms of historical merit, especially considering the general tendency of modern-day Catholics to disregard papal doctrine. 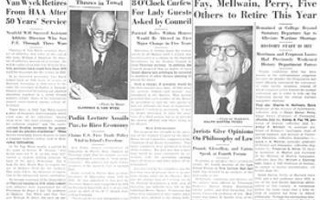 In the hours after telltale white smoke billowing from a smokestack atop the Sistine Chapel heralded the selection of a new pope, Harvard professors and a clergyman voiced hope Wednesday that the election of the Roman Catholic Church’s first ever pontiff from the Americas would spell an era of renewal for the Church.